Libby Cone, MD, MA, has been working with Edanz since 2013. In that time she has edited nearly 400 manuscripts for Edanz client authors. A radiology and imaging expert, Dr. Cone is not only an experienced scientific editor, but also the author of four works of historical fiction. A testament to her attention to detail and respect for the specifications of each journal is her office filing cabinet full of author guidelines for different journals, which she updates monthly. 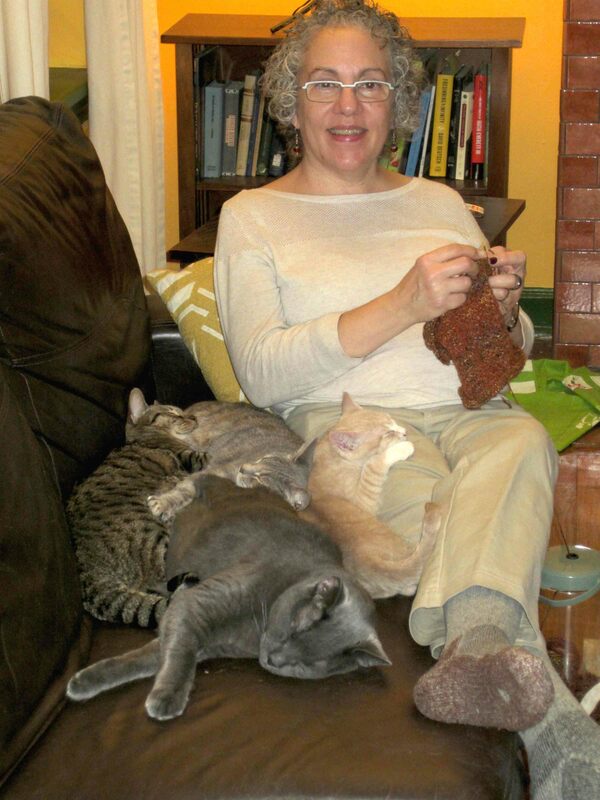 Dr. Cone lives in Boston, Massachusetts, USA, together with several rescue cats, pictured above providing love and companionship as she works on her knitting. When I was a medical student in 1982, I had a strong interest in Japan and managed to arrange a radiology elective at Hokkaido University. I spent 6 weeks in Japan, and it changed my life. I made many friends, most of whom I am still in touch with. Many of them were physicians trying to publish in English, and they asked for my help. I edited for years, not knowing what “Guidelines for Authors” meant, just using my grammatical skills. I had a very exciting career in radiology/nuclear medicine. However, owing to changes in practice (I was in two private practices that dissolved) and my frustrations in academia, I focused on temporary placements (locum tenens) for about 10 years. I started editing professionally several years ago, and revitalized it when the economy took a dive and I had few assignments. I think I like editing because I like medical imaging. Both require extreme attention to detail while not ignoring the large overall question. Both are task-oriented. Communication is vital in both areas. You mentioned that studying abroad changed your thoughts about your career direction; would you mind expanding on that? I had been planning to enter primary care, but I enjoyed my radiology elective in Japan (and I just chose to do radiology because I thought there would be less of a language barrier) so much that I took more electives when back in the US and entered radiology residency in 1986. I do some volunteer work. I have a large vegetable garden, and use a computer program to plan and follow its progress; I like trying to grow unusual vegetables such as salsify and chervil root. I also knit a great deal. All my trips to Japan involve knitting on the planes and in the trains (my husband, a big train fan, and I honeymooned in Japan); it is a great conversation starter. On my last vacation in Japan, earlier this year, on arriving in Sapporo I immediately went to my favorite store and bought yarn. Look for more Q&A with Dr Cone as well as other editors in the future. View Dr Cone's full profile.